The museum with an oval torus is often referred to as one of the most complex buildings in the world. 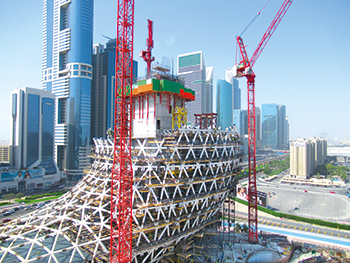 Meva formwork is helping BAM Higgs & Hill to create complex structures at the Museum of the Future in Dubai, UAE. Round, straight, labyrinthine and curved – the architecture of the project is exceptional, thus making its planning and implementation especially challenging. Designed by Killa Design for Dubai Future Foundation, the museum with an oval torus is often referred to as one of the most complex buildings in the world. While many structures repeat themselves even in spectacular high-rise buildings, this construction site is dominated by varying geometries both above and below ground, says a spokesman for Meva, the main formwork supplier on the project. In order to produce the numerous details correctly, BAM Higgs & Hill, the contractor on the project, took advantage of building information modelling (BIM). Three-dimensional depictions of the various construction phases and networked communication thus facilitated the planning work. 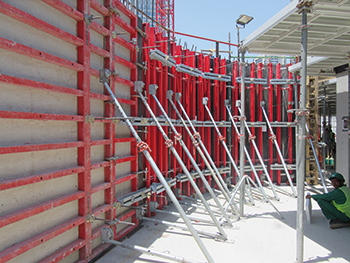 The Radius circular formwork can be connected to the Mammut 350 wall formwork without additional auxiliary equipment by means of assembly locks. For Meva, the precise 3D model proved to be a huge advantage, enabling it to efficiently plan the formwork system, according to MevaKHK engineer Sam Thomas. The labyrinthine basement of the Museum of the Future is smaller than the floors above and has no round walls or sloping ceilings. Using the 3.5-m-high panels of Meva’s Mammut 350 wall formwork system, it was possible to form the walls with extreme precision, he says. “The rate of placing was immaterial, thanks to the fresh concrete pressure capacity of 100 kN/sq m. It was thus possible to pour the walls quickly, irrespective of the concrete recipe and consistency, the weather conditions and the ambient temperature. After stripping, the outer walls of the basement were supported by Triplex R props to ensure they were secure while filling in the working area,” says Thomas. When the museum opens, the exhibits will be mainly displayed on the building’s first three floors, which are each split into two areas by a curved central aisle. Thomas says the use of Radius circular formwork allowed these walls to be formed precisely to the nearest mm. “The elastically deformable, 6-mm-thick steel facing could be bent to suit the shape of the building above a radius of 250 cm. The 7­-m-high walls in the entrance hall were completed after only two cycles using 3.5-m-high formwork panels. “No additional auxiliary equipment was required to connect the circular formwork to the Mammut 350 panels. Assembly locks connect the two systems both positively and non­positively,” he adds. Furthermore, it was possible to produce acute angles by creating a connection using a filler and Uni­assembly locks. “Meva formwork is easy to use, which is, of course, a huge advantage,” says Seamus O’Sullivan, construction manager at BAM. He adds despite the curves and various angles of this modern architecture, it was also possible to adapt the slab formwork system MevaDec to suit the building’s geometry. Primary and secondary beams can be used irrespective of the grid pattern, which minimises compensation areas. “We found the good concrete results achieved with MevaDec particularly striking,” says O’Sullivan. Furthermore, the MevaDec drop head allows early stripping, thus contributing to a reduction of the material stocks and ensuring rapid construction progress. In some areas of the building, the floors are connected by sloped slabs. Meva planned these areas in advance, and calculations were performed in order to produce a simple solution using the MevaFlex slab formwork. The 30-cm-thick slabs of the third floor are also slightly sloped and, in addition, are to be covered with grass. This creates a hill covering the first three upper floors. Above this grassed-over area, the steel construction shaped like an oval torus rises up to form the eye catcher of the new museum. The building core is being formed using Meva’s MGC climbing system and Mammut 350 formwork with cycle heights of 3.5 m.
“The MGC system was first preassembled on the ground to save time and then attached to the building with guiding profiles. It will remain here – securely anchored – during the entire construction and lifting phase,” explains Thomas. “In this project, one challenge was adding irregularly spaced box-outs, as the heights of the storeys vary and have to be taken into consideration during the climbing process,” he points out. When completed in 2019, the Museum of the Future is intended to serve as an innovative platform for start-ups and large technology companies where they can test and present their latest developments. Due to the planning tools and formwork systems used, it is already a showcase project for innovative construction.